This antibody detects a band of the same size by Western blot as ab4579, which was raised with a recombinant fragment of EMSY with no sequence in common with the immunogen for this antibody (and was raised 7 years after this antibody). The band detected by this antibody also runs at the same height as full length in vitro translated EMSY. This confirms that the band detected is EMSY. Recombinant fragment derived from residues 100 - 200 of Human EMSY. Our Abpromise guarantee covers the use of ab123 in the following tested applications. WB 1/3000. Detects a band of approximately 141 kDa (predicted molecular weight: 141 kDa). Variability in the size at which EMSY runs by Western blot has been experienced with different protein marker systems. EMSY has been observed to run at between 115 and 150kD. However, the independently raised ab4579 has been used to confirm the specificity of this antibody. IHC-P 1/500. Perform heat mediated antigen retrieval via the pressure cooker method before commencing with IHC staining protocol. WB using EMSY antibody (ab123) demonstrating the interaction between EMSY and BRCA2 by immunoprecipitation. Endogenous coimmunoprecipitation of EMSY and BRCA2 from unmanipulated asynchronously dividing HeLa cells. Immunoprecipitation with an unrelated antibody (anti-GFP), preimmune serum, ab123 or anti-BRCA2 antibody was followed by Western blotting with ab123. 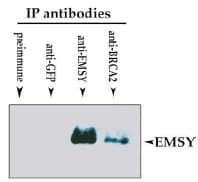 Neither of the unrelated antibodies could coprecipitate EMSY, whereas an EMSY signal was detected in the immunoprecipitate obtained with the anti-BRCA2 antibody. The anti-EMSY antibody could also immunoprecipitate endogenous EMSY protein. EMSY was immunoprecipitated using 0.5mg MCF7 whole cell extract, Rabbit polyclonal to EMSY diluted to 1/3,000 in RIPA buffer and 50µl of protein G magnetic beads (+). No antibody was added to the control (-). The antibody was incubated under agitation with Protein G beads for 10min, MCF7 whole cell extract lysate diluted in RIPA buffer was added to each sample and incubated for a further 10min under agitation. Proteins were eluted by addition of 40µl SDS loading buffer and incubated for 10min at 70°C; 10µl of each sample was separated on a SDS PAGE gel, transferred to a nitrocellulose membrane, blocked with 5% BSA and probed with ab123. Upper panel: EMSY responds to DNA damage. EMSY antibody (ab123) immunofluorescence staining of immortalized mouse wild-type embryonic fibroblasts before and after treatment with ionizing radiation (10 Gray at 1.8 Gy/minute, 250 kVp). EMSY assembles into nuclear speckles over several hours. Lower panel: Costaining with a monoclonal mouse antibody to gamma-H2AX reveals that EMSY relocalizes to DNA damage sites. Western blot of EMSY on MCF-7 cell lysate. Lane 2: ab123 at 1/500. Variability in the size at which EMSY runs by Western blot has been experienced with different protein marker systems. EMSY has been observed to run at between 115 and 150kD (even though the predicted size is 141kD). However, that the same size band is detected by both ab123 and ab4579 (raised with immunogens of different sequence) confirms the specificity of these antibodies. Lane 1 - Exposure time : 3 min. Lane 2 - Exposure time : 10 sec. May I use your antibody ab123 together with blocking peptide from Bethyl: http://www.bethyl.com/product/BP300-253 ? Following on from my email dated 21st November, I have looked into ab123 and whether we have the blocking peptide. Unfortunately on this occasion we worked with a collaborator lab to produce the antibody and therefore we don't have the blocking peptide to add to our catalogue. I am very sorry that on this occasion I was not able to provide you with a more positive outcome. Please do not hesitate to contact us if you need any more advice or information. This blocking peptide from bethyl is for use with their product A300-253A . 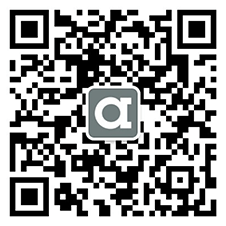 Since we do not know the sequence of this peptide, we cannot tell you for certain whether it is suitable for use with ab123. Currently, we do not supply the blocking peptide for ab123 but I have contacted the lab to see whether it is possible to add it to the catalogue. I will let you know when I get their response. Customer is interested in using an EMSY antibody for Western blotting. On the WB image for ab4580 there is a fairly strong band at 37 kDa seen. For ab123, the band at 37 kDa is present but is fainter. Is this band always seen with these two antibodies? Thank you for your enquiry. I consulted with a colleague and this band at approximately 37 kDa that is not always seen with these two antibodies. We are not sure what is it is, but it may possibly be a degradation product. If you have any additional questions, please do contact us again.